PMC offers free AudioQuest DragonFly with twenty series speakers | What Hi-Fi? Regular readers will know we've been waxing lyrical about the AudioQuest DragonFly USB DAC/headphone amp, and now PMC is offering a free one with the purchase of any of its twenty series speaker range. The offer will run from October 1st to December 31st 2012. By registering their purchase via the PMC website, UK customers can choose whether to have the DragonFly posted to them, or they can collect it from their local PMC dealer. 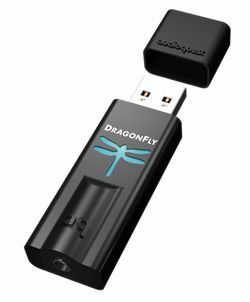 We've already awarded the AudioQuest DragonFly a five-star review, and praised it not only for its compact size, but also for its open, punchy and detailed sound. "This diminutive dongle turns any laptop or desktop computer into a bona fide hi-fi system – it's a fantastic little device," we said. Mike Picanza, PMC's head of sales, adds: "Our friends at AudioQuest showed us the DragonFly earlier in the year and we were impressed by what a simple and elegant solution it is to the issue of achieving better sound from a computer." We'd certainly agree with that. Click here to read our full review of the AudioQuest DragonFly.